Birch Tree Cottage | Toronto Short Term Rental Property Management Corp.
We had a family get together at the little blue cottage. The place was cute, charming, and the location was great. We rented bikes a few streets away and had a lovely family bike ride along the Niagara River. Communication was excellent and place as comfy and clean. Highly recommend. Convenient to just about everything. Don’t miss a chance to walk just down the street for an amazing meal at Backhouse Restaurant. I really appreciated the location of Birchtree Cottage. It was close to Niagara Falls and Lake Ontario. The rental was comfortable and my family felt safe. We loved the experience. Great home, very well layed out and great use of space. Everything was fresh and clean and the location is great for exploring the town. Mark's place was very comfortable with nice decoration. Was very quiet at night even though in a main road. Back garden was lovely. Very close to Main Street with shops and restaurants. Would recommend it. A great location for walking everywhere in Niagara on the Lake. The Birch Cottage was the perfect little setting for our wknd getaway. It’s within walking distance to the centre of Old Town where you can walk around exploring and enjoying all that the town has to offer. It’s was perfect for the 5 of us women celebrating 35 years of friendship. It met all our needs. BSS GIRLS Class of ‘86. Mark was a great host! Friendly, helpful and quick to respond! The house was beautiful and had everything we needed! Great location! We would 100% stay there again. Feels like home! Very spacious yet cozy home which has all the essential's and more. All room's had comfy queen size beds and everything (linen's, towels etc) was provided. Mark was prompt and quick with responses and very helpful. Thank you and we will be back! Wonderful cottage ! Great location and very comfortable for all six of us! Great overall experience for us to stay at this home. We stayed here for a family wedding at the Pillar and Post! The home was well equipped we did not wish for a thing. Thank you Mark you run a great business!! Great Little home! Perfect for relaxing and being close to everything! Overall was great! Very clean, and good room size. For those nice breeezy days, opening the front and back doors provide a perfect cross breeze while you cook in the kitchen or are just looking to cool down. Birch Tree Cottage was just great! We were a group of 5, performing at Fort George over the weekend, and we just thought it was perfect for us. The inside of the cottage is modern and new, the bedrooms are beautiful and comfortable, and we even took advantage of the spacious backyard since the weather was warm and sunny. The house was clean and the persons in charge (Mark & Cody) were very nice and easy to communicate with. We would stay there again in a heartbeat! Highly recommend! Three couples just spent the weekend at this cute little house in walking distance from down town niagara on the lake! The decor was beautiful and it was perfect for what we needed. The weather was excellent and we were able to eat at the outdoor patio table all the time! Bike rentals are just down the street and that was a fun way to check out the city and some close by wineries! Great Location, felt like home. Review #19281203 Charming cottage with great entertaining space! We had a fantastic girls weekend at the Birch Tree Cottage. The location is ideal for touring around NoTL and the backyard is a great spot to relax. We loved it! Review #19235243 Cute cottage, nicely appointed, well maintained, with good backyard, on busy street. We enjoyed our stay at the cottage. The management was very nice and the cottage itself was also very nice. The photographs accurately reflect that the cottage is well maintained and thoughtfully decorated. The bathroom was nice, if a bit small, and the backyard was prettier than we expected. There is no dining room, but the kitchen island with stools worked well for us. Birch tree cottage was clean, cozy and beautifully decorated. All the amenities were exactly as described, and there was a lovely patio area in the backyard to enjoy in the late afternoon. The couch in the living room was large and comfortable and accommodated two couples with room to spare. The location was excellent for a wine touring weekend - close to bike rentals, breakfast and easy walking distance to shops/restaurants on Queen St. It was a perfect space for 2 couples, but I also feel 3 couples could be comfortably accommodated. Mark was able to accommodate an early check in time for us, which was greatly appreciated and made our stay more enjoyable. Communication was clear and friendly. I would definitely stay here again in the future - we had a lovely time! Lovely home, true to photos and description. We had a great stay, home was clean and fresh, and kitchen was fully prepped. Location was great - 9-minute walk from the heart of downtown Queen Street, 6-minute walk from a bike rental store. 3 equal-sized rooms were perfect for the six of us visiting. We didn't realize the backyard was going to be so great as well - BBQ with patio, and covered seating. The owner was easy to deal with. No issues. Nicely decorated / modern and well equipped. Simply put, a great place to stay. The cutest house on the most gorgeous street and an easy walk downtown. We would definitely stay here again! Cosy, comfortable and clean. Good situation in Niagra on the Lake. Would recommend. Nice cottage with all needed. This a delightful cottage, tastefully decorated and very conveniently located. It comfortably sleeps six in three doubles. There is a generous garden with outdoor dining area and BBQ. Birch tree cottage was a 10 min beautiful walk to the downtown core with all the shops and restaurants- everything you need. Place was exceptionally clean and had all modern amenities. Would definitely stay here again. Baby, toddler, dog and adults all enjoyed! My family loved this place. The house was perfect for our needs. Clean as a whistle. Close to everything. Easy to get to where we needed to go. We would definitely go back in future. Mark met us once we arrived with the key, explained to me the house rules and said if I needed anything to call. That was it. We were not bothered the whole time we were there. Communicated by texts only. Once to tell him we were on our way and then again when we left and to say thank you for the wonderful stay. One of the reasons we chose this was that PETS ARE WELCOME. I would highly recommend this place to anyone who asked where to go for a nice holiday on Niagara-on-the-Lake, especially those who do not want to leave there pets at home. Pets are family! I didn't have to miss my nieces wedding thanks to Mark, as no other hotel in the area accepted pets and if they did, you could not leave them alone. Great house and great location. Mark was very kind and helpful. We will definitely be back. The place was great. Very clean, quaint and really enjoyed the backyard for bocce and the BBQ. Mark was great at communicating things to do and places to go in NOTL. He is a really friendly guy and does a good job. We had an excellent time with our family vacation, one great thing is when we arrived at the house late at night we slept in very clean beds, l will recommend Mark's house to all my friends. The birch tree cottage was a great atmosphere. The location was right in the heart of NOTL and close to everything. The cottage was net renovated, clean, and contained all necessary amenities. The backyard had a patio set and a BBQ that were perfect for outdoor meals. Mark was a great host. Quick to respond to any inquiries and even accommodated a bit of an early check in for us with no hassle. Would definitely recommend to a friend. The house was absolutely lovely and very clean. Mark was a gracious host. It was the perfect little cottage getaway that my girlfriends and I were looking for. 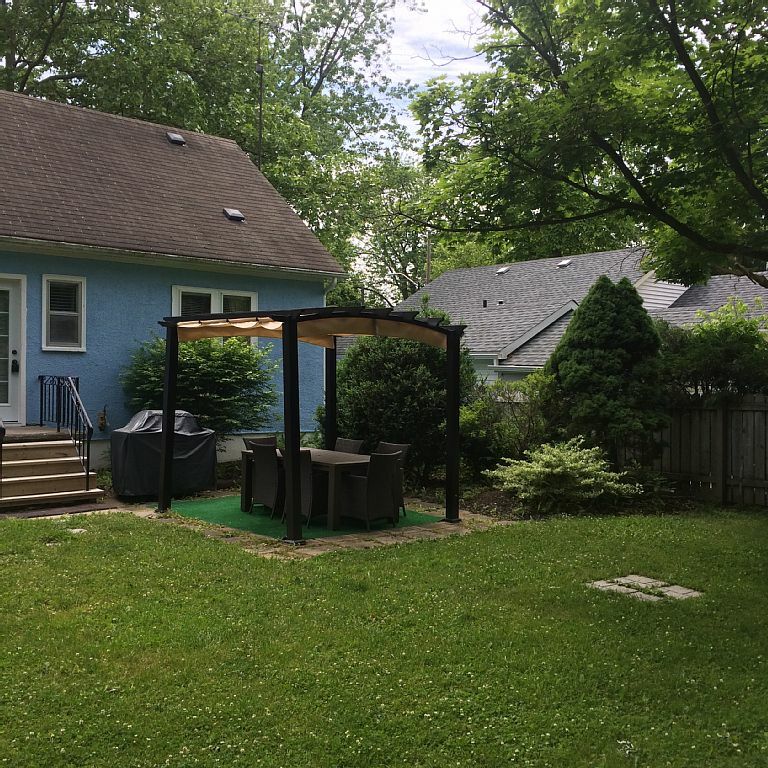 Walking distance to all the shops (and spa) and a beautiful quiet backyard too. Thank you! What a great place! We came for a wedding and the cottage was just right for myself, my two small children and my parents. Everything we needed was provided and the cottage was beautifully decorated. The backyard was great and the location was perfect for easy walking to downtown old town and all of the queen street shops and restaurants. The cottage is lovely, well appointed with all the amenities one needs. The location is within walking distance of all the NOTL shops, restaurants and historic sites. Ample parking, nice back yard, nearby park, wineries - all that you want to enjoy. I highly recommend this cottage. Everything was absolutely spectacular . Mark was wonderful, the house fantastic, the location perfect . We'd stay here again in a heartbeat . We were quite pleased with Birch Tree Cottage, and our host Mark was very accommodating. This was my first experience with Airbnb, and so I was a bit nervous about how it would all go, but I needn't have been. The space was lovely and cozy, and the location was excellent! We had a wonderful time at the Birch Tree Cottage in Niagara-on-the-Lake. The house was well appointed, tastefully decorated and very clean! It was a short neighbourhood walk to the centre of Old Town for coffee or a bicycle rental, and we enjoyed biking to the wineries close by. Mark made us feel welcome upon arrival and the amenities were all appreciated. Check in and check out were a breeze. We would definitely return if the opportunity arose. Mark was very responsive and accommodating with booking and check in. We stayed with two couple and an infant and the space worked perfectly for our group. It wasn't warm enough to spend much time in the yard but it looks like a great space to BBQ and relax. The house was very clean and in a great location- nice walk to Queen street and short drive to the falls. Definitely recommend! Mark was a great host, quick to respond to all requests. The cottage was clean and beautifully furnished. A lot of care and thought went into the stocking of this cottage from kitchen utensils to bathroom amenities. 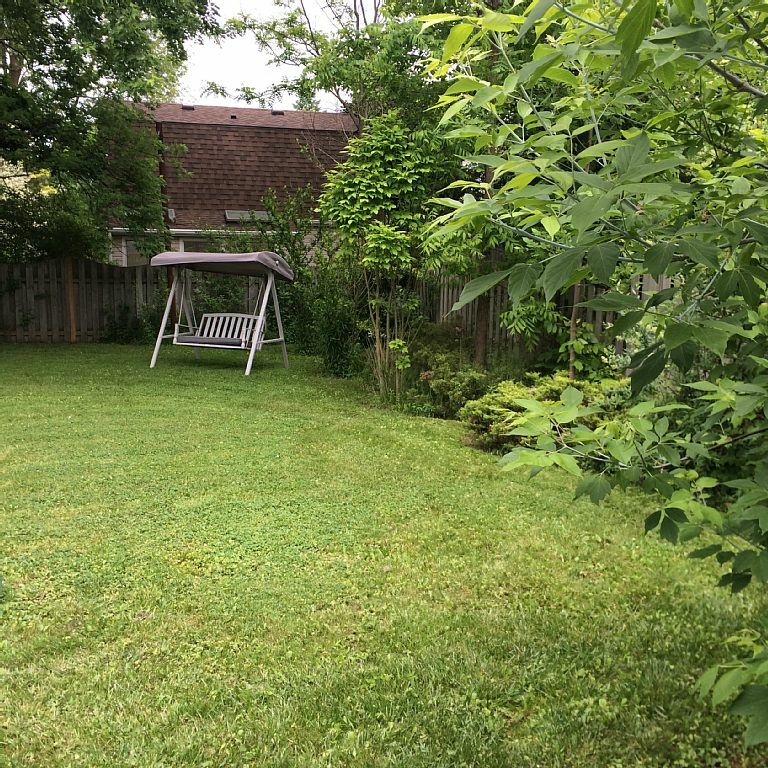 Walking distance to NOTL town centre and a big backyard for furry family members. Mark was a great host -- very quick to respond when we had questions and greeted us when we arrived with a lovely bottle of local wine! The house was nicely renovated and in a great location. We loved how easy it was to get to the hustle and bustle of town and all the wineries. We will definitely consider staying here if we return to NOTL. Beautiful clean home in a perfect location! Mark greeted us upon our arrival and walked us through anything we needed to know. Would absolutely stay here again. Loved our stay in the birch tree cottage. We stayed there With our 3 kids and it was exactly what we needed. The cute house was impeccably clean and serene. We were thankful for the 3 nice sized bedrooms and we especially loved the private backyard. We ate there several times while the kids played. Easy walk downtown and easier walk to that amazing bakery/coffee shop on the corner!! One suggestion would be to maybe add a few games and some sort of back yard activity. Also the house tended to get a bit musty if we weren't running the AC. Great stay. We loved our first visit to the Niagara Falls area!! Thank you!! Mark's cottage was the perfect home away from home for our family of 6 in NOTL. It was so close to town, tons of great vineyards and breweries. The house was extremely clean and decorated beautifully. We couldn't have asked for better communication; Mark was always responsive and even came over to help us with the wifi one day. Will definitely return to this wonderful home! We absolutely loved staying here! The host met us when we got there and showed us everything we needed to know about the house. He was very friendly and also shared information about the neighborhood, events going on, and gave us recommendations of places to eat. The house is about a ten minute walk from a cute little town with shoppes and restaurants. We walked there every morning for coffee! On our month long cross country adventure, we took a few days to explore the falls, taste wines and take in a show. The kitchen had everything we needed for a couple meals in, and the backyard was perfect to relax while the pups played. Clean, new and management was prompt and professional. What an amazing find. We were SO happy with this property. It was completely beautiful, and only a 5 minute walk to the main strip. Lots of great wineries within a 10 minute drive. The home was very clean and cozy, and we enjoyed using the back yard as well. Check in and check out were really simple.